As a new culinary Spot in Batam, maybe De light yag Café located in Ocarina was the first in meyuguhkan Menu that is supported by the view that pamper the eyes. Because in this place, visitors can not only enjoy a meal that is provided with a western concept, but also can enjoy the panorama of the Bay Batam Centre plus water games offered. "We try to be different from the concept in designing what is fit for visitor café De Light, here has also provided various facilities, plus five-star restaurant with a vehicle that is not owned by another restaurant," said Dedi, Sales Manager of De Light Café. 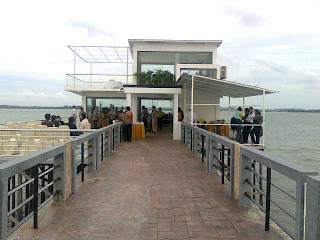 He mentioned, the difference compared to De Light Café is another place to eat, the water taxi (sea transport), which connects, Batam View Beach Resort with De Light Café. In addition it also provides games, like Jet Sky, games and other water safe for visitors who want to enjoy the challenge of cafés that have been provided. "Safety is our priority in serving visitors who may want to enjoy the panoramic bay Batam Centre to play Jet Sky, besides visitors can also enjoy the water taxi if you want to feel or spend lliburan to Batam View Beach Resort Batam," Dedi Papar. Furthermore, the Café under management control Batam View Beach Resort is, to be special because that provided menus typical Batam View. De Light café menu presents western, oriental menu to a seafood menu to be enjoyed by visitors. "Everything we Boxed-style five star hotel, with affordable prices and adjusted," said Dedi added. In the meantime in order to promo its soft opening, Café De Light gave the 20 percent discount to all menus presented. In addition to the holder of a credit card visa and master tone aka additional discount of 5 percent. "Promo was presented to the end of July 2010, is intended to memeberikan waivers for customers or families who enjoy the dishes while relaxing in the De Light Café. In addition, De Light Café will also be a pier at the same time the waiting room for the tourists who use online dream destination in the form of water taxi. Dream destination line is a means of liaison Mega Tour Ocarina and Batam View Beach Resort. Water taxi is a vehicle for tourists in Batam Centre menikmai panoramic bay.